These are not phrases you want to hear about something that provides you with a necessary service. So, if these were the terms used to describe the system that provided your drinking water, you would be concerned…right? Well, we have bad news. These are the exact words applied to U.S. drinking water systems, which have received a measly “D” on the 2017 Infrastructure Report Card. This report, which is conducted every four years by the American Society of Civil Engineers (ASCE), is a comprehensive assessment of the nation’s 16 major infrastructure categories to evaluate their current state. The results are expressed in an A through F letter grade based on key criteria like public safety, resilience, and funding. Shockingly, the ASCE estimates that the U.S. must invest approximately $3.6 trillion in overall infrastructure repairs and improvements by 2020 to reach acceptable standards. There will obviously be many upcoming challenges regarding sub-standard infrastructure, but because we’re focused on water here at SimpleWater, we’re going to explore the problem of failing drinking water systems and what that means for your water quality (and your wallet). What Does A “D” Grade Mean? As bad as receiving a “D” grade is, it is not a rare occurrence. 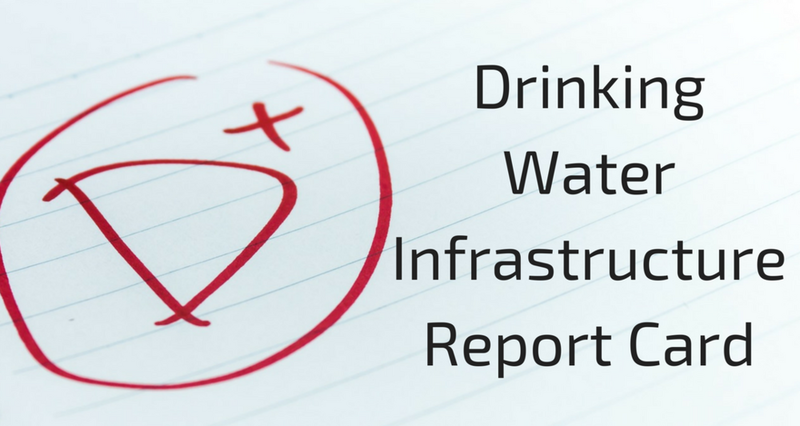 Along with drinking water, 10 other sectors received a score of D+ or below. In fact, U.S. infrastructure was assigned an overall all grade of D+, which (not so inspiringly) managed to improve upon the D average it received in 2009. Generally between 75 and 100 years old, the country’s drinking water infrastructure is approaching, if not extending beyond, the end of its functional life. The ASCE estimates there are approximately240,000 water main breaks every year in the U.S–meaning our pipes are wasting 2.1 trillion gallons of water a year. This is both expensive and inefficient. Despite the fact that our overall drinking water quality remains “high”–particularly in relation to other parts of the world–much of the nation’s drinking water system requires a large scale investment. Cities like Flint, Michigan demonstrate just how urgent the issue is, as aging pipes can quickly lead to dangerous health problems when not properly managed. While major investments by federal and state governments are critical for improving drinking water infrastructure, there is no set timetable for when they are to be implemented. Fortunately, you don’t have wait for authorities to take action to learn about how the nation’s D-grade impacts your water quality. Check out Tap Score, our home water testing kit, to learn more. Newer PostWhy Is My Water Yellow?